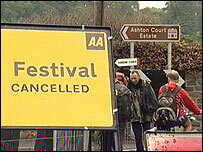 The second day of the Ashton Court Festival has been cancelled because of bad weather. Rain began to fall in Bristol on Saturday night and continued into Sunday morning. Thousands of revellers had been expected on the second day of the event when former Blur frontman Damon Albarn was due to play with his new band. "The health and safety of our audience is what is important," said organiser Steve Hunt. "Although this will be a huge disappointment to the many people who have worked hard to make this festival happen, I am sure we have their support in ensuring the festival is safe for the public," he added. Organisers have asked people not to come on to the site, although some - including one person from Cornwall - did not know the event had been cancelled and turned up anyway. 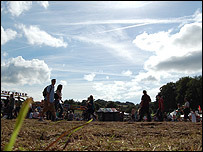 Ian Evans, another festival organiser, told the BBC: "We have been told it is not possible to provide emergency services on site, and we cannot therefore comply with our licence conditions." Asked about the future of the event, which relied on public donations to go ahead this year, Mr Evans added: "We were relying on getting income from today, and this will put a hole in our finances. "We need to work out what that means." The festival had a very successful and largely sunny start on Saturday, said Mr Hunt, who added that tickets would be refunded. More than 80 bands had been scheduled to play on Sunday. Some now plan to play at The Croft, The Lansdown and The Louisiana in Bristol during the afternoon and evening. Kate Salisbury, BBC journalist and singer/songwriter with Redd, which were due to play at the festival on Sunday, said: "It is a big shame as a lot of people had worked hard to get this rolling again. "People had a fantastic time yesterday."